I tried to go a little out of my color comfort zone on this one…so I threw in that salmon color and I wasn’t so sure about it. Now I think I like it though. It’s more mild than using red…and not too orange either. This (of course) was my quilt inspiration. I love that colour in there, it really 'pops' as they say and gives the quilt a lift. It's when we leave our comfort zone we learn new and exciting stuff! There are some really pretty corals in the "Flora" line by Lauren & Jessi Jung…they also do the same kinda thing as orange or red but are just more soothing. I LOVE love love this quilt! It's so pretty, and I really think the coral/red gives it what it needs. I love it! It could easily be fore a boy or girl, because the color is not too much. It is a darling quilt! Its fun to step out of your "color" comfort zone sometimes! My favorite quilt was one I didn't want to make because it was all neutrals, whites, creams, tan, but it turned out so beautiful! I'm a huge fan of it! 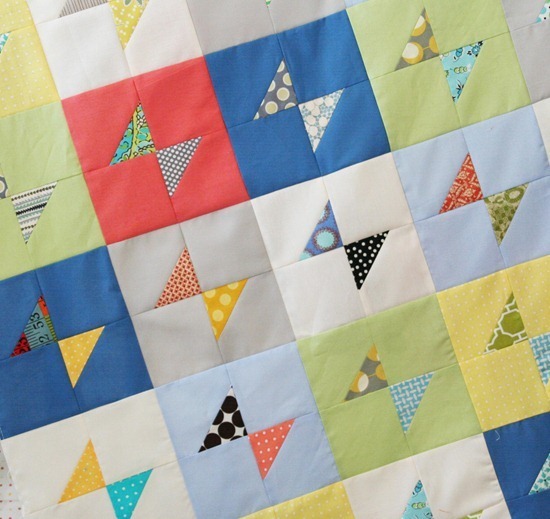 I love the little salmon pops – a great boost to the whole quilt!! Thanks for sharing!! What a fun rendition of this quilt! I love love love this quilt! Especially the salmon, so fresh and clean! I love the salmon … it gives the pop to your quilt, like the red binding does in your inspiration quilt. I think the salmon adds an element of surprise as all the blues/greys/greens have the same feel–the hue of the salmon keeps your eye moving—it's great! What a great little quilt! Simple but lovely! I really like the salmon. It really compliments the green solid you used. Well I really like the salmon but hat is one of my favorite colors. The quilt is beautiful. What a great cause. I send to quilts for Kids. love doing them. What fun. What a fun quilt! Love the salmon (or like we say here in the south, sammon). I like the pop of color in there- looks great. It was such a pleasure meeting you at the SS Allison. I can't wait to put your great FMQ tips to use! I love it! I think the salmon color really sets off the other colors. Perfect! what a great quilt! I love the colors & soothing feeling it gives. This is a fantastic donation quilt. Venture out of your comfort zone more often, it's beautiful! What a fun quilt! LOVE the mix of prints and colour! I'm adding this to the ONE OF MANY quilts of your's that I LOVE. 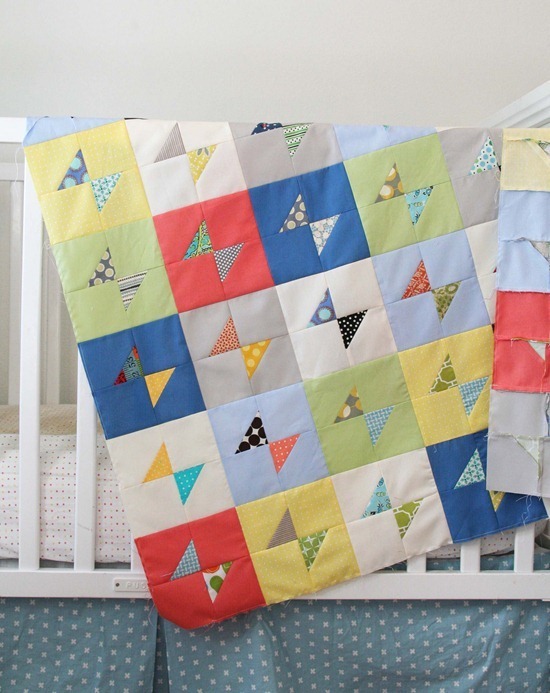 Such a perfect quilt for a boy or a girl. And the pop of salmon? Awesome. The colours work so well together, and I just love the bow tie pattern as well. Great quilt for a great cause! i LOVE this quilt and i think throwing the salmon color in is just what it needed to pop. good job! Great idea idea using the salmon color, works well. I really like this one. The 'calm' solids and the visual prints but in small touches. Love this quilt – such great colours! I had a mini heart attack when I saw that you had linked to my silly little quilt! Thanks so much for sharing the love. And I think your colors here are genius. Reminds me of little bow ties. I love it. What a beautiful quilt! Love the colors! I love the salmon color thrown in, it gives it some pop!! Love the design too! That salmon color really added to the quilt. It gave the quilt a little pop without overwhelming it. Some lucky child will be so happy to receive it. I'm like the above person, that salmon is beneficial to the quilt. Children love those bright colors and whoever gets this one will be a lucky winner. Congrationulations to a super pretty quilt. so cute! easy to make? Really pretty — I love a.l.l. the colors. Looks great to me :) I love the pop that the salmon gives this sweet little quilt and kudos for participating in this great cause. I think the salmon with the blue gives such a lovely retro vibe. Perfect! I absolutely LOVE this. I'd never have chosen the fabrics – but that is what makes it so great. Many of my quilts end up being similar. This is really different and it works! Oh this is GREAT! I love it. Well done on trying something a bit new! Oh, Allison, I love this!!! And, I think the salmon color totally makes everything pop :) Amazing work, as always!! !